A prominent feature of this painting is the glow in the sky. The obvious contributors to this effect are the darker tones placed around and over the area of lighter colour. This is easy to understand and therefore easy to plan when composing the painting. Dark clouds and dark silhouetted trees were part of my plan for this painting. However having said that, the lighter colours in the sky have a brightness which would nearly work without the help from the darker contrasting tones. The accompanying video shows how I achieved that light yellow glow. I have found it almost impossible to mix these shades on the palette. One of the biggest difficulties is in mixing very light colours. The colour on the palette is isolated from the painting and there is no way of knowing if it is right until it is placed in situ. Then you realise the tone is not right. In this painting I painted a layer of pure Cadmium Yellow, with solvent only, into the area of the sky where the light will be. The Prussian Blue is added in a similar way in the appropriate areas of the sky. When the solvent has evaporated, a mix of this blue and white is added, with no medium or solvent added, on top of the previous layer of blue. This is dragged into the gap between the yellow and blue and there is a little bit of overlap onto the yellow. Pure white is placed, without brushing, on top of the yellow, heavier in the centre and less so the further out from this centre. When the white is in place, gently brushing it with a flat brush will make it pick up the yellow underneath. The more you brush the more yellow it becomes. Similarly, with the blue. This allows you to adjust the colour relative to the rest of the sky. An important part of this process is the use of only 2 colours, Cadmium Yellow and Prussian Blue. Too many colours in a mix reduces the chroma of the resultant colour. Have a look at the video to see how this works in practice. See you soon. 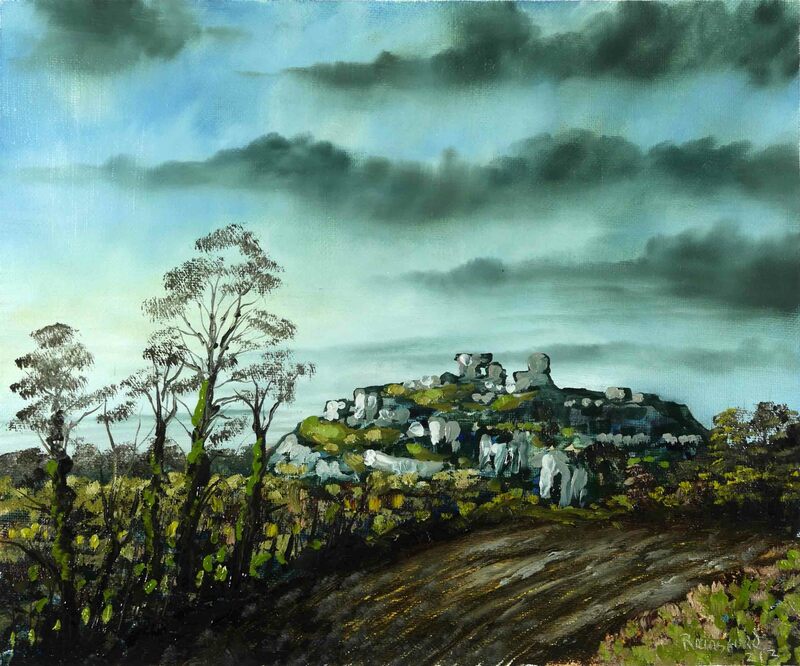 This entry was posted in Oil Painting and tagged Art, Culture, Dunamase, Education, Inspiration, Irish landscape, Oil Painting, Oil Painting Instruction, Oil Painting Landscape, painting, Pictures, Rock, Time lapse painting, Trees, winter. Bookmark the permalink.